Early in the night at the 2018 Sydney Gay and Lesbian Mardi Gras party, DJ Gemma dropped the Yothu Yindi classic 'Treaty'. All around me the mostly non-Indigenous crowd responded to the driving beats, the unmistakeable sound of the yidaki, and the call of the late M. Yunipingu's distinctive voice. The dance floor surged with energy. A friend later commented he'd forgotten how much the track was 'an absolute banger'. 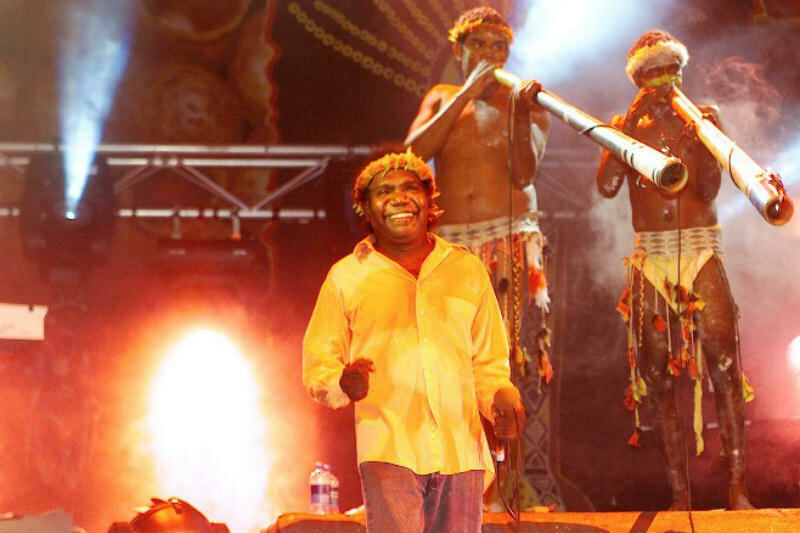 More than a banger though, the 1991 track remains a political anthem, speaking of unceded sovereignty and calling for settler politicians to honour their commitments to treat with Australian First Nations. It is a song of deep political significance to Aboriginal and Torres Strait Islander peoples and, as was evident on the Mardi Gras dancefloor, it also moves something in non-Indigenous Australians — and not just their feet. The negotiation of a treaty or treaties with the Australian state has long been an aspiration for Aboriginal and Torres Strait Islander people. For many progressive Australians too, the lack of any formal political agreements with Indigenous peoples is an injustice and an embarrassment that they would like to see rectified. Some non-Indigenous supporters of treaty negotiations are only now coming to this position, developing new understanding through the failed campaign to 'recognise' Aboriginal and Torres Strait Islander peoples in the Australian Constitution, and through the position on truth-telling and agreement-making advanced in the 2017 Uluru Statement — the one-year anniversary of which we mark on 27 May. Others, however, have supported the call for treaty/ies since at least the Treaty '88 campaign and the Hawke government's commitment to negotiating a national treaty after receiving the Barunga Statement. Hawke's backdown on this commitment — with the formal reconciliation process offered as compensation — paved the way for John Howard's definitive rejection of treaty in his claim that 'A unified nation cannot make a treaty with itself.' Such political equivocation — and downright colonialism — remains a source of shame for many. Both longterm supporters and newcomers to the debate want to address this shame. As the 1992 Mabo case established once and for all, the Australian continent was never terra nullius. The legitimacy of the colonial project on this territory was in question from day one, as both James Cook and Arthur Phillip ignored orders from their king that they take possession of the land only 'with the consent of the natives' (Cook), and 'conciliate their affections, enjoining all our subjects to live in amity and kindness with them' (Phillip). "The contradiction is between the progressive desire for moral legitimacy, and the political aspirations of Aboriginal and Torres Strait Islander peoples, which in many cases are entirely different." What eventuated was, of course, as far from amity and kindness as can be imagined. Frontier warfare that lasted for over 100 years; massacres and violent dispossession of Aboriginal and Torres Strait Islander peoples from their land; forced incarceration on reserves and missions; and the mass abduction of Indigenous children in what would eventually become known as the Stolen Generations. This is not a history of which it is easy to be proud. Despite the claims of certain conservative politicians that colonisation was good for Aboriginal and Torres Strait Islander peoples, evidence of colonialism's manifold harms abounds in daily news reporting and in the Australian government's continuing failure to 'close the gap' in socioeconomic outcomes for Indigenous people. As a result, many progressives recognise the need to change the terms of the relationship between Aboriginal and Torres Strait Islander peoples and the Australian state as a means of redressing these harms. Again, however, this is not just benevolence. Progressives also hope that in restoring some degree of autonomy and dignity to Indigenous peoples, providing long-overdue justice and reparation, Australia might restore its own moral legitimacy. What is not discussed is the way in which this craving for moral legitimacy may also jeopardise any future treaty negotiations. Underpinning the desire for moral legitimacy is an imagined future in which Australia is a unified political community. Rather than dividing Australia, it is hoped that treaty will bring the nation together. In this imagined future, colonialism would be 'complete', something inevitable but unpleasant and now — thankfully — over. The contradiction, however, is between the progressive desire for moral legitimacy, which requires colonial completion, and the political aspirations of Aboriginal and Torres Strait Islander peoples, which in many cases are entirely different. Far from concern about settler Australia's moral legitimacy, Aboriginal and Torres Strait Islander peoples seek treaty as a form of recognition for their surviving political difference. They seek self-government, autonomy and jurisdiction over their territories. Treaties on these terms are unlikely to be acceptable to the settler state. More to the point, they would not provide the longed-for moment of unified nationhood and colonial completion. Treaty/ies will formalise ongoing relations between sovereigns, rather than bringing these sovereigns together under the Australian flag. The crowd on the dancefloor at the Mardi Gras party enjoyed a feelgood moment. Many progressive non-Indigenous Australians crave that moment in our politics. But we need to be careful. What we crave is really a moment of completion that will always remain elusive, and our craving remains the greatest threat to any meaningful treaty processes between Indigenous nations and the Australian settler state. Associate Professor Sarah Maddison is Assistant Dean, Research in the Faculty of Arts and Social Sciences, co-director of Indigenous Settler Relations Collaboration, and Research Coordinator in the School of Social and Political Sciences at the University of Melbourne. May I suggest you look at this? http://caama.com.au/news/2018/warlpiri-elder-ned-jampijinpa-hargraves-and-his-views-about-treaty This is what I speak about all the time. Treaty as we are hearing its is not for us it is for whitefella purposes at this stage. We do need to do exactly as Uncle says. I live in Melbourne and seem to be a lone voice in both worlds on this yet the political treaty is not for us. it needs to be discussed for as long as it needs to be and not in orchestrated white fella consultations but in a circle of equals who are able to hear each other. We are not pawns to appease white peoples consciousness. Happy to chat. A deeply disturbing reality check for us of the settler community who "hope that in restoring some degree of autonomy and dignity to Indigenous peoples, providing long-overdue justice and reparation, Australia might restore its own moral legitimacy." I'm currently stalled in preparation of a submission to the Joint Select Committee tasked with developing a form of constitutional change which reflects the Uluru Statement from the Heart, and yet is able to win the difficult conditions for approval of constitutional change in Australia. I find Professor Maddison's paper deeply disturbing because it clearly states the main challenge to developing an amendment which adequately provides for the recognition of Australia's First Nations in our Commonwealth Constitution - the main challenge being that many Indigenous Australians still yearn for a degree of political self-determination which appears all but impossible in our interdependent nation. Australia is a federation of six sovereign States. The Constitution provides for the addition of further States. One possibility, therefore, for doing justice to this land's First Peoples is to use this provision to add further sovereign (Aboriginal) State(s) to this federation. This is a very thoughtful and valuable piece, Sarah, but it comes from a very particular perspective, that of the self-styled "progressive". You are obviously really keen on this term which you use a lot; indeed, this has rapidly become the dominant ideology of the left, (where in general I had always placed myself). My main problem with this neo-progressive mindset is that it seems inherently socially divisive, by dividing us all up into identity groups and then energising especially those seen as (and indeed may well be) "Victims", of one sort or another. This of course has been the USA Democratic Party way for a couple of decades, and quite successfully so politically though no-one really seems to have benefited; dramatically it ran out of steam with Mrs Clinton, and it is difficult to know where her party now takes it. I am a citizen of Australia and proud of it; I am also an American-European immigrant who has settled well in spite of some imposed limitations by usually being "the foreigner" in most situations; but I don`t dwell on the slights or detriments because the advantages of citizenship of this country are so great. Although I recognise the terrible scale of sufferings of my Aboriginal fellow citizens, and their current need for special help for at least some/many, I cannot think of any real advance except together as respected equals under the Law and under the Constitution. No more divisions, please, as thy can only end in more tears. Queen Elizabeth 2nd is our head of state. As England created the problem surely any treaty should be with the UK. I’m not sure about any ‘craving for moral legitimacy’ that goes beyond ‘many progressives’. I am more inclined to think that your average Joe just wants things to move on and wonders why the Rudd national apology didn’t fix things. Yes, the biggest hurdle to treaty etc is that it doesn’t offer an easy resolution and, as you say, will likely accompany claims ‘for self-government, autonomy and jurisdiction over their territories’, and politicians know that Australians, won’t buy into change that promises further division. Be hopes Noel Pearson and Warren Mundine can get bipartisan support in calling for an historic unifying ‘parliamentary declaration’ and a refocus on the development of local indigenous representation and governance – building (at least) upon the processes that were so successful with Uluru.